While capital city Vientiane rushes towards modernity, one remarkable centre helps women with their future by reviving Laos’ age-old traditional crafts. The Houey Hong Vocational Training Centre for Women provides training and employment opportunities to disadvantaged women in dyeing, weaving, tailoring and small business administration. Travellers can tour the centre and have fun in a natural dyes workshop, learning the art first hand by dyeing their own silk scarf. There’s a wondrous atmosphere when we ride our bicycles up the forested lane to the compound. Though it is the height of hot season, the centre is alive with industry and activity; everyone is doing something. The sewing machines hum, the looms clatter, the spools fly, the fires crackle and the pots above clatter and bubble with today’s colours – ruddy brown, golden orange and an indigo so rich and deep it’s almost black. Skeins of silk are about to go in. Silk threads boiling in a brown dye made from onion skins. Founded in 1998 by Chanthasone Inthavong, the centre provides vocational training to women of disadvantaged backgrounds, many from poor rural areas and ethnic minorities who have little or no education. The trainees stay in dormitories at the centre so they can develop their skills over time within a supportive community – sometimes it is the trainee’s very first time outside of her village. They learn valuable skills they can take home with them, everything from how to source natural plants and prepare them for dyeing, to how to manage their work as a small business, including production, costing and quality control. Learning how to tailor and use a sewing machine is especially important for women in Laos so they can turn raw materials into products and therefore build more sustainable, profitable businesses. Houey Hong’s one- to three-month long beginner course covers measuring, calculations, making patterns and using the machine. Anyone who has ever tried to learn how to sew will appreciate the technical skill it requires. Sections of the fibre are tied off with plastic so they will resist the dye to form a pattern known as ikat. Houey Hong relies on donations, funding and the sale of products and activities to operate. Many travellers try to skip Vientiane but Houey Hong’s natural dyes workshop is an excellent reason to spend time in the city. Dyeing is more complex then simply dunking threads into coloured water. It is an artisan skill that requires years to master, with knowledge passed on between generations. Each material and dye requires different methods, temperatures and mordant to fix the colour – and oh, what colours! Nature yields incredible hues: red is created from stick lac resin (resin from the insect Coccus lacca), yellows can be made from hard wood of the jack fruit tree or marigold flowers, Thai ebony fruit creates a dark, dark brown. Indigo is one of the oldest dyes known to mankind and it’s the most fascinating. The tradition spans the globe, from ancient Mesopotamia to modern day Japan. Peer into the centre’s indigo pots to smell the distinctive aroma and see the greenish-blue liquid bubbling away – it’s living fermentation, and the vat must be regularly “fed” to be kept healthy and alive. Travellers can learn all this and more, plus try the tie and dye technique on a silk scarf. For one scarf the full program takes two hours, costs 100,000 kip per person. Two scarves takes three hours, costs 180,000 kip per person. You can also opt for a one-hour weaving introduction (50,000 kip), or a whole day class of weaving or both weaving and dyeing (250,000 kip including lunch). Men, don’t be shy: anyone can enjoy this class. Other ways you can help: Make a financial donation and sponsor a training group. Your money helps with a trainee’s equipment, materials, travel from her village and boarding. You can also shop! The on-site shop sells exquisite one-of-a-kind silk and cotton textiles and scarves, some of the finest quality we have seen in Laos. Scarves start at 160,000 kip and go up with the level of detail and man-hours – excuse us, woman-hours. 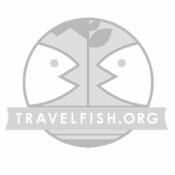 Drop in and take a tour (25,000 kip). Hopefully you will meet Sengmany Vongsipasom, Houey Hong’s inspiring, energetic and passionate manager. The centre is located on Lane 19, Ban Houey Hong village. Head 7 kilometres straight north on Thongkhankhlam St. For those on a bicycle, the road is paved and very flat. After Houey Hong market, Lane 19 will be on your left. At the top of this dirt road there is a sign for the centre, an enormous gated home and a sign for a maternity hospital “Hopital Central de la Mere et Nouveau-Ne.” Refer to the map on their website. Alternatively, you can request for them to arrange a tuk tuk for you, departing from downtown, round trip costing 50,000 kip. Browse our independent reviews of places to stay in and around Vientiane. Read up on where to eat on Vientiane. Check out our listings of things to do in and around Vientiane. 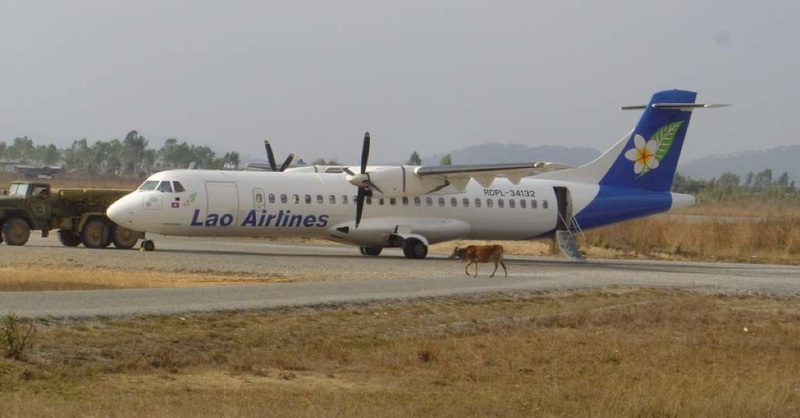 Read up on how to get to Vientiane. Planning on riding a scooter in Vientiane? Please read this. 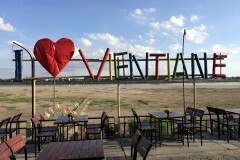 See below for more sights and activities in Vientiane that are listed on Travelfish.org.